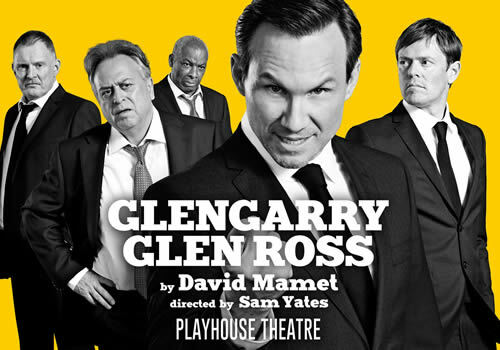 9 November 2017 - "certainly worth the watch"
American actor Christian Slater returns to the stage to star in a major revival of David Mamet’s multi-award winning drama Glengarry Glen Ross. Running for a limited 14-week season at the Playhouse Theatre, the production marks the play’s first return to the West End since the 2007 show at the Apollo Theatre, starring Jonathan Pryce. A tale of lies, corruption and greed, Glengarry Glen Ross takes place in a high-pressure sales office in Chicago. With a group of cut-throat salesmen at the core, who will do anything to achieve their goals, time is running out. As they become increasingly desperate to sell the most real estate, one thing becomes abundantly clear. Close the deal and you win. Blow the lead and you’re out. Star-studded casting includes Christian Slater of Heathers and Mr Robot fame, who last appeared in the West End in One Flew Over the Cuckoo’s Nest in 2004 and 2007. Further casting includes Kris Marshall (Love Actually), Don Warrington (Death in Paradise), Robert Glenister (Hustle) and Stanley Townsend (Florence Foster Jenkins). Glengarry Glen Ross is directed by Sam Yates, who has led award-winning productions including the recent Murder Ballad at the Arts Theatre. Written by David Mamet in the 80’s, the play received its original premiere in 1983 at the National Theatre, directed by Bill Bryden. Going on to open on Broadway a year later, the production went on to win the 1983 Olivier Award for Best Play, as well as the 1984 Pulitzer Prize for Drama. Coming to the West End at a time when American politics and society is under fierce debate and scrutiny, the pertinent play is sure to strike a chord with a contemporary audience. Playing for 14 weeks at the Playhouse Theatre, the production runs from October 26th 2017 to February 3rd 2018, with an official opening on November 9th 2017. Glengarry Glen Ross is not suitable for children.